The adage "better to have too much than not enough" is the reason why many families end up with so many leftovers. 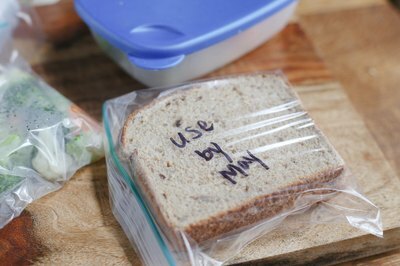 Food is only safe to eat for two hours at room temperature and only lasts up to one week in the refrigerator, but freezing leftovers can preserve them for up to about six months. This practice is especially useful when you cook too much around the holidays or when you want to take advantage of a sale. 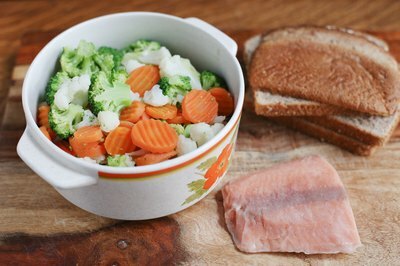 The list of prepared food leftovers you can freeze is much greater than the list of foods that don't freeze well, meaning that little of what you eat has to go to waste. You can freeze any type of meat, including seafood, chicken, pork, beef and lamb, whether you have leftover roasts, meatloaf or even meat pies. Leftover bread doesn't have to lose its freshness. Most breads store for two to eight months, pastries last an average of six weeks, and cookies can be frozen for up to six months. Many vegetables and leftover fruits also freeze well, except those with high water content like cucumbers, lettuce, watermelon and apples. The curds and whey in creamy foods like yogurt and sour cream tend to separate when frozen. Hot foods added to the freezer raise its internal temperature, which can put other frozen foods at risk for spoilage. Leftovers should be cooled before placing them in the freezer, but because food is only safe for two hours at room temperature, you must cool them as quickly as possible. Transfer leftovers from large containers into several smaller containers, preferably shallow, wide containers. This allows a greater surface area exposed to air so heat can escape quickly. As an example, leftover chicken soup cools much faster on a dozen shallow plates than in an 8-quart stockpot. For even more rapid cooling, place the containers inside larger containers of ice that draws the heat from the leftovers. Leftovers should be frozen as quickly as possible to preserve quality and texture, so avoid freezing more than 3 pounds of food per square foot of freezer space at one time. Oxygen exposure causes freezer burn and ice crystal formation, which can leave food tasting stale and unappetizing. The key to avoiding ice crystal formation is packing leftovers in containers that allow little air to reach the food. 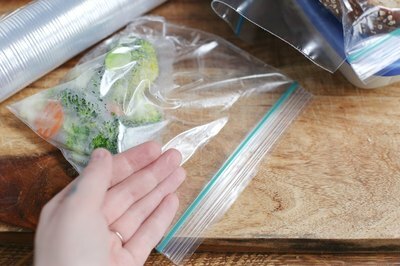 Squeeze out as much air as possible from freezer bags or fill plastic containers close to full. All freezer storage materials, including plastic containers and zipper-seal bags, should be rated for freezer use to ensure they provide maximum moisture-vapor resistance and don't become brittle at freezing temperatures. Add extra protection by wrapping some foods in plastic wrap or aluminum foil before placing them in freezer bags or containers. 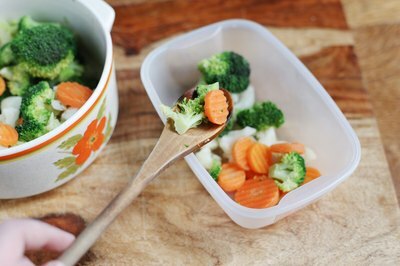 Small containers work best because the contents freeze faster, preventing mushy food, and allow you to thaw and cook the leftovers in smaller quantities. 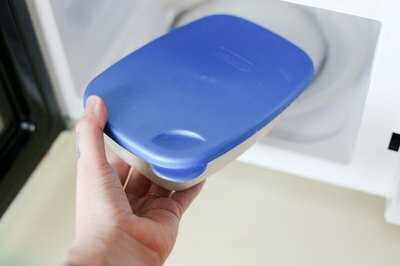 Leftovers can be frozen indefinitely, but the quality of food begins to decline after a recommended window that varies with different types of food. A general guideline for most complete meals, including pizza, TV dinner-type meals, sandwiches and casseroles with meat, is three to four weeks of freezer storage time. Meatless casseroles, including macaroni and cheese and green bean casserole, retain their flavor for two to four months. Soups, chili, stew, pasta sauce, and sloppy Joe filling -- all considered combination meat dishes -- are best consumed within four to six months of freezing. Roasted and fried beef, poultry, pork and fish have a suggested freezer life of one to two months. These freezer shelf life guidelines depend on proper cooling and packaging practices. Some frozen foods -- mostly breads and sandwiches -- can be cooked and reheated from a frozen state. In most cases, foods should be thawed before reheating for best results. Reheat the food to a minimum temperature of about 165 Fahrenheit to kill all bacteria. After reaching the reheating temperature, maintain a minimum temperature of 140 F to keep food within the safe zone. Refrigerate any leftovers.